Olga - Super light, great for combination skin! This is the first serum i used from PC and immediately i fell in love with it! It's superlight and great for my combination, sensitive skin. It doesn't irritate at all and immediately after applying it makes my skin more radiant and soft. Blemishes vanish and i wake up every day with glowing skin! Great product! After regular use of this serum, my skin does look better in terms of overall texture and radiance. My makeup goes on much better as well. I apply it after a prescription retinol at night and this combination works well for my skin. Nick - Super light Super effective. 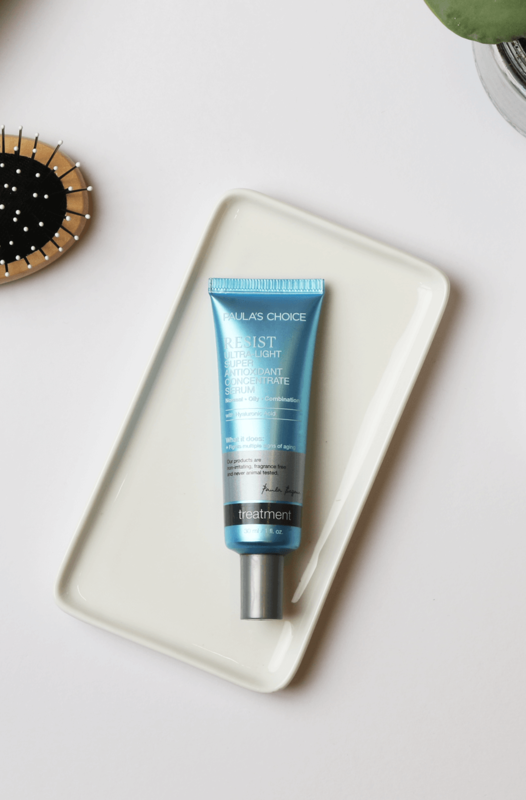 Amazing texture, so light and spreadable i actually have normal to dry skin but i love layering this serum during the day for that extra antioxidant protection. And surprisingly i notice that my skin still feels comfortable by end of day when i use it. Daria Vezzi - Perfect for oily skin! This serum is the best choice for summer using. Super light, leaves skin very refreshed and moistured. Natalia - Great serum, keeps up with expectations! Very good serum, I like the lightweight texture and lack of strong odour. It is easily absorbed and I use it after exfoliating at night on its own and in the morning after washing and before applying sun protection and make up. Will be ordering a third time. Hello to everybody. I have a very sensitive, normal to dry skin. I need to pay special attention to the ingredients I put on my face, as well as avoiding too mat or too oily textures. This serum is very light indeed and absorbs quickly and easily leaving no trace on the skin which makes it great for layering products. Of course if used alone, it is not enough for normal skin, but on the other hand, for oily/very oily skin, you can absolutely try it wearing alone. For me it is a great base to start with, and it works wonder underneath the moisturizer or sunscreen. Sometimes I just put a good amount of product on my under eye area. The price is not affordable, but the formulation of this product is really worth it. Another good point is there is no added fragrance or anything like that, so there isn't really a scent to it. I have not a big experience of serums but this seems to be a good one. I like the idea of giving a great deal of antioxidants on my skin with using this. I like the feel to it, it is light and smooth and not tacky. It is simple to use and you need only a couple of drops. One minus: sometimes when layering products it burns a little. This serum alone does`t but using a toner and an exfoliant before this it sometimes does. I have really sensitive skin that cannot tolerate retinol well, so I decided to try out this retinol free serum. Unfortunately it really made my skin irritated and red for some reason. 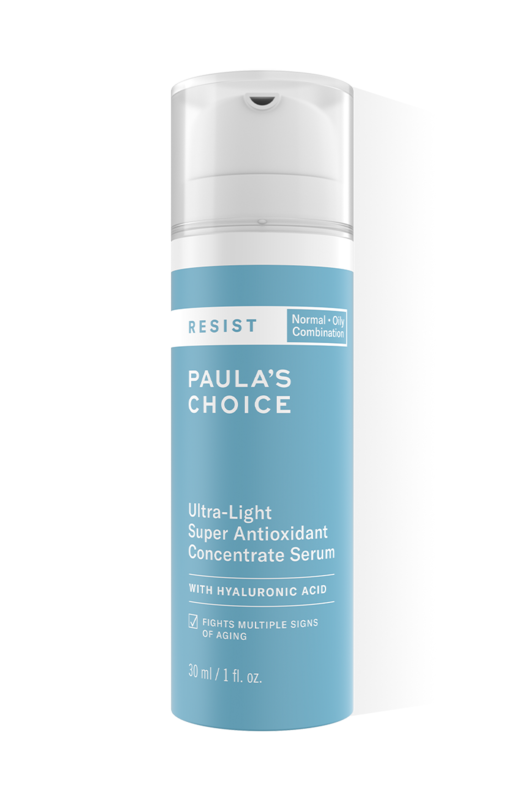 I've never had a problem with Paula's Choice products, but there is just something that my skin doesn't like in this formula. I've been using this serum for a month and find it hard to write a review as I'm not sure just how beneficial it actually is. It sinks right in, it's a bit moisturizing and it doesn't clog pores. I would survive without it though as I cant really tell if it makes a difference in the long run. It sinks in very fast, leaving my face immediately ready for the sunscreen and foundation. It leaves no trace and my skin feels nice. I believe it is the fastest simplest way to get an anti-oxidant boost in my daily routine. It has not broken me out, it actually calms my skin down, but alone it does not prevent breakouts. Complemented with good facial cleaning -I still use the Toleriane dermo-cleanser, it is well rated by Paula herself and cheaper for us in EU - and BHA I have significantly reduced my acne. If the package is kept in a cool place, standing up to prevent air contact, and never gets to develop a specific smell, I have absolutely no reason to worry about oxidation. Feels nice and does not irritate my skin in any way. I was a bit alarmed by other reviews claiming it oxidises, so I use it only at night and usually feel comfortable enough without adding moisturiser on top. My only complaint: some of the product had spilled when I received it, which could have been avoided if the container was sealed. Customer Care : Thank you for your review. We are sorry to hear about the container. Please feel free to contact our Customer Care department. they will be happy to help you with a solution. When I received the Super light antioxidant serum the cap wasn't really closed and the serum is yellow. I wonder is it supposed to be yellow or is there something wrong with it, because I've heard that if a antioxidant serum is yellow it has oxidized or something like that?! Customer Care: There are several ingredients in that product that contribute to its color (f.e., Epigallocatechin Gallate), including the vitamin C. The color of the product does not represent oxidization, rather it’s the actual color of the raw materials used. The color can also vary from one batch to another. Non sticky, non greasy, no silicone type feel- just super light and sinks in very quickly. No irritation at all, so not quite sure what some previous reviewer meant with tingling feeling. My skin is normal with medium oily t-zone but can be also sensitive. Finished it quick though , quicker than expected ( a bigger tube would be grand) and forgot to reorder ,so doing it now. My skin has missed it !! It seemed to balance the moisture in my skin but also even out the skin tone . The smell and colour are absolutely no probs. Is this supposed to burn when I put it on? I have tried a sample of this and I get an unpleasant stinging sensation which takes about 10 minutes to go away... customer care, please advise. Thank you! Customer Care: We are sorry to hear of your experience and discomfort. Although this is not a common response, we do understand that each customer is uniquely different in how they will respond to products or ingredients. We will contact you by email to discuss alternatives. I have the same problem as the other reviewer - this product oxidizes to a bright yellow color. It also makes me unsure of it's effectivenes since it's yellow (like already oxidized) in the tube. On the other hand, I don't remember having this jaundice problem with the sample I tried before ordering full size. Other than this, I really like this serum. It's thin enough to go under sunscreen (that is, if I were able to use it in daylight), yet provides some moisture and makes my pores look smaller. Under eyes it makes me look wrinkly, though, but I can use other products for that area. I have ordered a couple of samples to try this product. It has a lovely texture and spreads wonderfully, however it unexpectedly oxidized on my skin. I applied my usual skincare and makeup routine, swapping only my serum (skin balancing) for this one. In 15 minutes my skin has turned to a bright yellow color. I tried again the next day and got the same result. I have to stick to the wonderful skin balancing serum, and envy all those users who don't have the oxidization problem with this product. Customer Care: Thank you for your review. We are sorry to hear of your experience. This can happen if too much of the RESIST Ultra-Light Serum is used, or not given enough time to dry before applying a mineral sunscreen. We will send you some more samples to try out if using less of the serum or taking more time to dry will help. You could also consider to you the Ultra-Light Serum at night. Guiomar - Great product and Customer Service! I had some samples before, and then I decided to order one. I'm still trying to find out which one it's the better for my ageing but still breaking-out skin, so I tried the skin balance line antioxidant before this one, but I think I'll stick to the resist ultra-light. Looking at the ingredients it's one of the best serums I have found (and much cheaper than the other options I was considering). But to be honest I really value in an online service the customer support, and I really want to say they are wonderful. This bottle (I brought some more things) was open, and a little bit spilled and dried, this worried me, so I wrote them. The next day they sent a new one without any more hassle to me. I'm really happy now and I'm sure I'll keep buying from them. Anna - Great, great serum! I ordered this without trying a sample at first, since I read some very positive reviews on the american website. And I'm sure not disappointed! 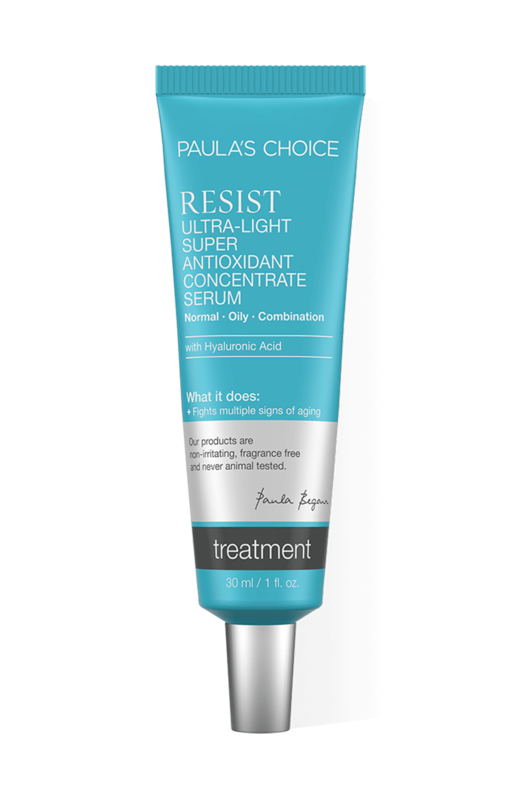 I've only used it for a week, so for now I can mostly say something about the feel of the product, which is very different from the Resist Super Antioxidant Serum that, to me, has a quite sticky feeling. My skin is usually oily on the nose with enlarged pores, but dry other places due to sun damage, I presume. I use it both at night and at daytime, and especially at day I'm happy with the product, since my face (my nose) doesn't shine! And it keeps matte almost all during the day, which never have happened before. I would definitely recommend this product to people who have a skintype as mine!